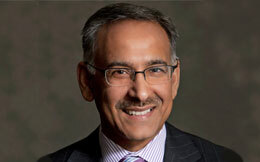 Dr. Mehmood Khan, MD is PepsiCo’s vice chairman and chief scientific officer of Global Research and Development. In this role he oversees the PepsiCo global Performance with Purpose sustainability initiatives, designed to enhance environmental, human and talent sustainability, and he leads PepsiCo’s research and development (R&D) efforts, creating breakthrough innovations in food, beverages and nutrition – as well as delivery, packaging and production technology – to capture competitive advantage and drive PepsiCo’s businesses forward. During his tenure at PepsiCo Dr. Khan has led the company to become the leader in innovation for the food and beverage industry while at the same time transforming its portfolio. Today nearly 25 percent of PepsiCo’s net revenue comes from its “everyday nutrition” brands that make healthy eating an easier choice for consumers. Prior to joining PepsiCo, Dr. Khan was president, Takeda Global Research & Development Center, overseeing Japan’s largest pharmaceutical company’s worldwide R&D efforts. Previously, Dr. Khan was a faculty member at the Mayo Clinic and Mayo Medical School in Rochester, Minn., serving as director of Diabetes, Endocrine and Nutritional Trials Unit in the endocrinology division. He also spent nine years leading programs in diabetes, endocrinology, metabolism and nutrition at the Hennepin County Medical Center in Minneapolis. Dr. Khan received his medical degree from the University of Liverpool followed by training in internal medicine in England. He did his post-doctorate training at the University of Minnesota in nutrition and endocrinology. He became a doctor so that he could make a positive contribution to alleviating disease and suffering. Working at the University of Minnesota and Mayo Clinic as a physician and scientist, Dr. Khan helped countless patients who were suffering from illness enjoy a better life and conducted research that led to significant advancements in the understanding of nutrition and endocrinology. At Takeda Pharmaceuticals he oversaw the development of new life-saving medicines that have helped millions around the world. It was his passion to make a difference on global population health that led him to his current role as Vice Chairman and Chief Scientific Officer at PepsiCo, where he leads their work on developing new, healthier products for consumers around the world. “If not us, then who?,” Dr. Khan is known to say as he talks about dedicating his life to serving others in a positive way. Named one of the “100 Most Creative People in Business” by Fast Company magazine in 2015, Dr. Khan has injected fresh new thinking into PepsiCo that is having a positive impact on communities around the world. Importantly, his work extends far beyond developing healthier products. Dr. Khan oversees the company’s global sustainability agenda, focused on shrinking PepsiCo’s environmental footprint, conserving natural resources and promoting sustainable agriculture. This work is producing very tangible results. For example, in 2014, PepsiCo decreased its absolute water use by approximately one billion liters. He has also pushed to expand sustainable farming practices that help local growers increase yields and incomes. And through the PepsiCo Foundation, the company has partnered with NGOs to provide access to safe water to six million people. Dr. Khan’s ambitious sustainable vision at PepsiCo — which translates into some of the food industry’s most innovative work across water, agriculture, environmental sustainability, and corporate citizenship – is making PepsiCo a model for how a global company should operate in the 21st century. Additionally, Dr. Khan strengthens PepsiCo’s global network, reputation and knowledge base by launching research projects with leading universities and technology companies, as well as by spearheading collaborative work in the fields of agricultural and nutrition science. He serves on the Sackler Institute Board, the United Nation’s Public Private Partnerships Advisory Group and is Chairman Elect of the US Pakistan Business Council, US Chamber of Commerce.